“A database that replicates itself and is meant to survive” — that was the connection that Cockroach Labs CEO Spencer Kimball made between the startup’s memorable name and its value proposition. Despite entering a crowded market, Cockroach has been able to gain the favor of some of the best known VCs in tech. Today’s $27 million Series B is being led by Redpoint with participation from Benchmark, GV, Index Ventures and FirstMark. At its core, CockroachDB is an open-source database service optimized to reduce downtime. Every time you visit a website, every time you check your bank account and every time you log into your favorite social networking app, you’re dependent on databases to be ready and able to feed you necessary information. CockroachDB quite literally replicates itself like an insect and distributes information so it doesn’t become a sitting duck, or die if we’re keeping with the metaphor. The company calls this feature multi-active availability. No matter how widespread the adoption of your company’s product or service, minimizing failures is a priority. In addition to the new capital, Cockroach is also officially launching its version 1.0. Kimball tells me that during the beta period and even earlier, eager customers, largely startups, were implementing the service before it had been deemed fully ready for deployment. That’s a scary proposition, but it speaks to the community that the team has been able to build over the course of the last three years. “We are planning a 1.1 in five months and then we will move to a six month cadence,” Kimball told me in an interview. Originally started as a GitHub project, Cockroach will be monetizing around a paid enterprise tier. 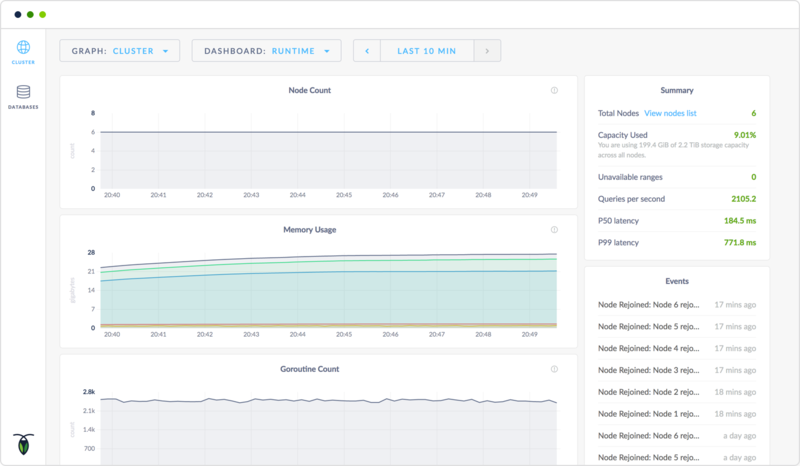 This premium version will include distributed backup and restore functionality in addition to enterprise support— things that are not optional for serious users managing large amounts of data. Chinese tech conglomerate Baidu is one of Cockroach’s earliest customers. The company has been testing Cockroach, processing two billion inserts a day while simulating nightmare scenarios to check for resiliency. Moving forward, Kimball has a concrete idea of where he wants Cockroach to be by the end of the year. In lieu of a boilerplate statement about growing sales channels, Kimball hinted at an upcoming feature called geo-partitioning. The goal is to enable granular control of replication by geography at the column level. Cockroach differentiates itself from Google CloudSpanner by being open source, but geo-partitioning can only help the company further differentiate. The feature not only has the potential to reduce latency, but allow for greater accommodation of data sovereignty.